The CHAD domain is an alpha-helical domain functionally associated with some members of the adenylate cyclase family . It has conserved histidines that may chelate metals. The CHAD (conserved histidine alpha-helical domain) is an uncharacterised domain, with a characteristic pattern of conserved histidines and other charged residues. It is predicted to adopt an alpha-helical fold. The sequence conservation pattern suggests that this domain is likely to contain two repeat units, with at least 4 helices each, at its core. The conserved charged residues could form a strongly polar surface that could participate, either in metal chelation, or act as phosphoacceptors [(PUBMED:12456267)]. Escherichia coli uncharacterised protein YgiF. 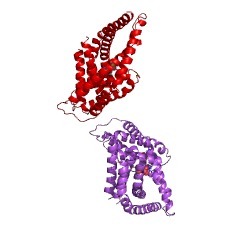 Mycobacterium tuberculosis uncharacterised protein Rv2226/MT2285. There are 9559 CHAD domains in 9557 proteins in SMART's nrdb database. Taxonomic distribution of proteins containing CHAD domain. This tree includes only several representative species. The complete taxonomic breakdown of all proteins with CHAD domain is also avaliable. Click on the protein counts, or double click on taxonomic names to display all proteins containing CHAD domain in the selected taxonomic class. The catalytic domains of thiamine triphosphatase and CyaB-like adenylylcyclase define a novel superfamily of domains that bind organicphosphates. BACKGROUND: The CyaB protein from Aeromonas hydrophila has been shown topossess adenylyl cyclase activity. While orthologs of this enzyme havebeen found in some bacteria and archaea, it shows no detectablerelationship to the classical nucleotide cyclases. Furthermore, the actualbiological functions of these proteins are not clearly understood becausethey are also present in organisms in which there is no evidence forcyclic nucleotide signaling. RESULTS: We show that the CyaB like adenylylcyclase and the mammalian thiamine triphosphatases define a novelsuperfamily of catalytic domains called the CYTH domain that is present inall three superkingdoms of life. Using multiple alignments and secondarystructure predictions, we define the catalytic core of these enzymes tocontain a novel alpha+beta scaffold with 6 conserved acidic residues and 4basic residues. Using contextual information obtained from the analysis ofgene neighborhoods and domain fusions, we predict that members of thissuperfamily may play a central role in the interface between nucleotideand polyphosphate metabolism. Additionally, based on contextualinformation, we identify a novel domain (called CHAD) that is predicted tofunctionally interact with the CYTH domain-containing enzymes in bacteriaand archaea. The CHAD is predicted to be an alpha helical domain, andcontains conserved histidines that may be critical for its function.CONCLUSIONS: The phyletic distribution of the CYTH domain suggests that itis an ancient enzymatic domain that was present in the Last UniversalCommon Ancestor and was involved in nucleotide or organic phosphatemetabolism. Based on the conservation of catalytic residues, we predictthat CYTH domains are likely to chelate two divalent cations, and exhibita reaction mechanism that is dependent on two metal ions, analogous tonucleotide cyclases, polymerases and certain phosphoesterases. Ouranalysis also suggests that the experimentally characterized members ofthis superfamily, namely adenylyl cyclase and thiamine triphosphatase, aresecondary derivatives of proteins that performed an ancient role inpolyphosphate and nucleotide metabolism.